Pope and Talbot Steamship Co.
Portland & Asiatic Steamship Co.
For 40 years, this was the dominant firm in the coastwise traffic along the West Coast of the US and to Alaska. The company originated in a San Francisco Bay operation carrying water to ships in the harbor from springs in the upper reaches of the bay. The Pacific Coast SS Co proper began in 1877 and eventually attracted the attention of investors from the eastern US, but the intense competition that developed following the Alaska gold rush kept profits down, and the shareholders used the excuse of a fire on the company's largest ship in 1916 to sell the company to Hubbard F. Alexander, who merged it into his Admiral Line. The flag was blue with a white lozenge charged with a red cross paty. The Pacific Far East Line was created by Thomas E. Cuffe after World War II to take advantage of the availability of surplus wartime cargo ships. The line was exceptionally successful for its first decade, operating across the Pacific with 31 ships by 1949 and an especially strong position in shipping US military cargoes. However, after Cuffe suddenly died in 1959, the standard of management declined and the company repeatedly missed opportunities to upgrade to the new container technology. It finally went bankrupt in 1978. 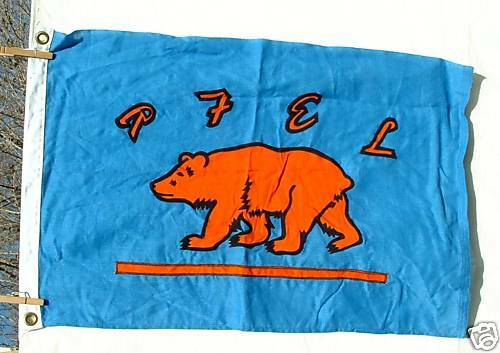 All PFEL ships had names ending with the world "Bear," and the flag was blue with a golden bear below the script letters PFEL. Image of an actual flag offered for sale on eBay. The Pacific Mail Steamship Company was founded in 1848 by William Aspinwall of the firm of Howland and Aspinwall to execute a contract to carry mail from the Isthmus of Panama to the newly-annexed territory of California. Fortuitously for Aspinwall and his fellow investors, Pacific Mail was ideally positioned to cash in on the Gold Rush of 1849. As a result of this and the high quality of its service, the company became both an important part of the history of the American West as well as one of the most profitable enterprises of its era, with an annual return on investment that ran as high as 30%. Within five years of its inception, the company was running 18 steamers and it peaked at 23 in 1869. In that year, however, the completion of the transcontinental railroad foretold the end of the high profits of the Panama-California route. PMSS also neglected to keep up to date technologically and began to suffer from competition from other companies, especially the Occidental and Oriental SS Company. For a time, the line survived on subsidized mail contracts to Australia and New Zealand, but when it lost those it was soon forced to accept a takeover by the Southern Pacific Railroad Company in 1893. In 1912, Congress banned ships owned by railroads from using the Panama Canal, so Southern Pacific sold PMSS to the Grace Line, which operated it as a subsidiary under its traditional house flag from 1916-25. It was then taken over by Robert Dollar & Co., which merged PMSS into its own operation, although it, too, continued to use the old name and flag on occasion. With the government bail-out of the Dollar Line in 1938, ownership passed to American President Lines, but by this time PMSS essentially existed only on paper. It was formally closed down in 1949 after just over a century of existence. The flag of the Pacific Mail Steamship Company was a swallowtail of five horizontal stripes, red-white-blue-white-red. Pacific Mail SS Co. According to Loughran (1979) the company sometimes used prior to 1868 a long tapered swallow-tailed pennant, red with narrow white borders top and bottom and the bearing the white letters "P.M.S.S.Co." in descending scale. 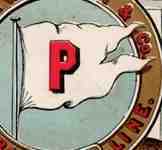 An early 20th century sailing ship line flying a white flag with a blue border and the name PALMER in red. The Palmer Fleet. Lloyds shows as William F. Palmer and Loughran (1979) expands that this schooner owner was not connected with another operator of the same period, Nathaniel T. Palmer of Bath. Nathaniel did not have a houseflag as such, instead placing a large black "P" on the foresail, but his ships did have their own individual flags and with this being named after family members confusion can result. Loughran shows two examples for Nathaniel T., both being white tapered swallowtail pennants, that for the "Palmer" having a blue border except at hoist and the red legend 'PALMER", that for the "N.T.Palmer" having a red border except at hoist and the blue legend "N.T.PALMER". Sources: Lloyds 1912, Wedge (1926), National Geographic (1934): a white swallowtail with a black P.
Source: US Navy's 1961 H.O. : a blue over red swallowtail with a white triangle in the hoist extending to the fork, and a blue P on the white triangle. In 1925, Standard (Indiana) purchased the Pan American Petroleum and Transport Company, which continued to operate under its own name. Pan Am operated as a subsidiary under its own name as Standard's main transportation arm. Only in 1954 was it subsumed into Standard's corporate identity. Before that its flag was green with an orange disk bearing a monogram of the initials PT in white. Pan-Atlantic Steamship Corporation, Mobile (1933-1960). The Waterman Steamship Company established this company in 1933 to conduct coastwise operations while the parent company focused on overseas routes. The trucking magnate Malcolm McLean bought Pan-Atlantic (and subsequently the rest of Waterman) in 1955, eventually converted it to container ships, and renamed it Sea-Land in 1960. The flag was blue with a white diamond bearing the black letters P-A (note the resemblance to the Waterman flag, which was the same but with a black W). A subsidiary of Alcoa (Aluminum Company of America). The flag was white with three red horizontal stripes surmounted by a blue bordered white circle bearing a blue letter P (note the resemblance to the original Alcoa Steamship Co flag. The only reference I have found to this company refers to it as "of Monrovia," so I assume this is or was a US-owned firm operating under the Liberian flag. The house flag is fairly attractive, a blue-white-blue horizontal triband, on the center a yellow lozenge covering about half the hoist, inscribed with a red letter P.
Patriarch Steamship Co. Located New York and operated the "Patriarch Sky" 1965-1971. As recently indicated by fearsome ferrets (a term of praise) the New York Public Library Digital Collection has many vex treasures on offer, one of which is this menu: http://digitalgallery.nypl.org/nypldigital/dgkeysearchresult.cfm?keyword=+%22patten+line%22 of a luncheon held on 29 Jun 1901 on board the 'Thomas Patten�. Flag image, detail of Image ID 469235: white swallowtail with tapering edges, bordered blue (except at the hoist), bearing blue name �PATTEN LINE� sans serif. Named in fact �Sea Bright & Long Branch Steamboat Company�, the firm was founded by entrepreneur Thomas Patten Sr for his son, Thomas G. Patten. The ships linked New York to nearby places appearing in the company name, running daily at low cost. In 1918 there were financial difficulties but 1929 meant really the end when the remaining vessels were sold to another local operator, the Keansburg Steamship Co. Many flags, an onomast (name pennant) among them but not the one in attachment, on �Mary Patten�: http://www.ppyc.net/ssmarypatten.jpg. One of a number of companies running clippers from the United States to Australia during the Australian gold rush of the 1850s. The Peabodys are a prominent old family in the Salem and Boston shipping industry--Salem's excellent maritime museum is named for them. There were a number of famous shipping firms in which they were principals, but this is the only one for which I've found a house flag. It was merely a white swallowtail with a red letter P.
The source is a sailing card, that's no longer present at its old URL, but it can still be found on oldwww.ballarat, through web.archive.org. Another example is at http://library.mysticseaport.org/manuscripts/CPageImage.cfm?BibID=34412&Box=1&Folder=16. In both cases, and in all other sailing cards they used, it seems, the flag looks more or less the same. away from the viewer, or is this intended to be a tapering flag? This American version of the P&O was formed by combining the ships of the Plant Line (founded 1885) and those belonging to Henry Flagler. Both Henry Plant and Henry Flagler were railroad magnates who had major roles in the development of Florida as a tourist haven, Plant on the west coast of the state and Flagler on the east. Plant's railroad ended at Tampa and Flagler's at Miami (later extended to Key West) and both had the idea of extending their service with cruises to Havana. The P&O thrived until after World War II, when competition from airplanes began to erode both the passenger and cargo base. By 1949, the line was down to one small ship. Ten years later, the Cuban Revolution and the ensuing US embargo put an end to the Cuban tourist trade, but the P&O limped on for another few years trying to compete in the Caribbean cruise market between Miami and the Bahamas. The flag had a rather Bavarian look, a burgee lozengy in blue and white, with the initials P&O in red (the china at steamship.net shows blue) on the central white lozenge. This was a small independent tanker company. It existed at least into the 1970s. The flag was blue with white stripes along the upper and lower edges, on the center a white lozenge with a red P.